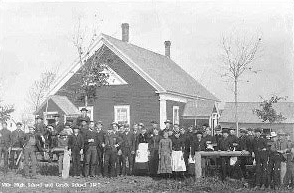 One of the features of Milo’s history which will mean the most to those of us who are indebted to our education to its excellent school system, is the story of development from the two little school houses which dated back to our first town meeting. The last decade of the 19th Century marked important improvements, particularly in the High School. The difficulties which young people who contemplated high education then encountered was exemplified, Vernon K. Gould who was one of the first Milo boys to go to college. When he wished to enter Maine State College (now the University of Maine) he discovered that his education in the old Milo High School which he had attended was woefully inadequate preparation. Consequently, he went to Charleston Academy (now Higgins Classical Institute), which even in the Nineties was a college preparatory school. Some other Milo students likewise desired education, which they could not get in their hometown and went there at the same time. In order to devote more time to their studies out of town they arranged for my great-aunt Nettie A. Gould to go there also and keep house for them. Subsequently, my great-uncle completed college preparatory work in Hampden Academy and was able to enter Maine State in the class of 1898. This year’s work of our schools will, I think, compare favorably with any preceding year. We have had some teachers of rare excellence and their efforts merit the highest commendation. Others, through a want of thorough qualifications and experience, have not been as successful. It is well known that success of teachers is exceedingly variable. As a rule the commence too young, at an age when their minds are too immature to appreciate the responsibility and dignity of their calling. No amount of supervision can make a school successful with poor teachers. When there is trouble in the desk the whole machinery runs amiss. If you would raise the standards of our schools you must raise the standard of our teachers. Water will not rise above the fountainhead. Pursuant to a vote passed at the last annual meeting, I have prepared a course of study that would recommend that it be printed in pamphlet form with such changes as our new school board see fit to make, together with some rules and regulations for the help of teachers and pupils. The course of study was adopted at the fall term. I t required considerable labor to arrange the classes and get each scholar in his proper grade and class; especially so in the High School where they had allowed to study anything and everything, from the spelling book to the Greek grammar. The Primary and Intermediate course is substantially the same that they have been pursuing the last two years. the High school course, which is usually followed by those who end their school life in the High school, has received a great deal of consideration. The college course has been made to accord with the requirements for admission to those institutions. The number of scholars in town April 1st, 1893, were 314, a falling off of 21 from last year, and a decrease of 34 from 1890. During the time the village gained three and the rural districts fell off 37. The village shows a much larger per cent of attendance than the other schools. No 5 had 188 scholars, eighty per cent of which attended school. The other eight districts had 126, with an average of seven pupils to each school. Some plan should be devised to bring these children together, in sufficient numbers to maintain a respective school. Besides being ver expensive, you cannot create the interest in a school of seven or eight pupils that you can where there is a larger attendance. Realizing the seriousness of the responsibilities developing on me, I have attempted to conscientiously carry out the work trusted to my care. [end of quote] I.G. Mayo, Supervisor. The small rural schools existed up until the school years of some of the older people in this town. The education problems of the farmer’s children, which incidentally included ourselves, also the statistics of school attendance are enlightening and the excellent teachers can be the subject of fascinating tales in this day and age — but, that is another story. M.H.S. Forever − Milo High School. Above article edited by: C.K. Ellison, 2002.